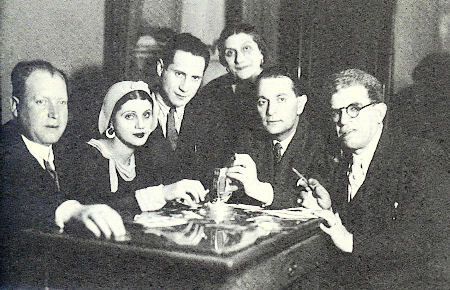 l. to r.: A. Sandow; Luba Kadison; Joseph Buloff; Chanah Kadison; I. Sternberg; Leib Kadison. Hear about the professional lives of Luba Kadison and her husband Joseph Buloff, and the time they spent with the Vilna Troupe, excerpted from an interview conducted by Martin Boris with Luba Kadison in 1998. Each section is introduced in a written form, but you can listen to the entire clip, i.e. more than what is written, by clicking below on the phrase "Listen to it." Please note that it may take twenty seconds or more for each clip to download, depending on the speed of your computer. 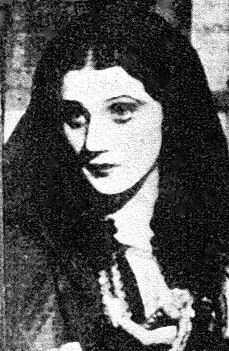 Luba Kadison, a native of Kovno born in 1907, was a prominent Yiddish actress who performed in Yiddish theatres all over the world. During World War I, the Russians ordered all Jews to leave Kovno within twenty-four hours. From there, she and her family traveled by train to Vilna, where they began life anew. 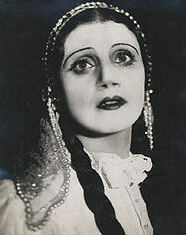 While living there, Luba became a member of the Vilna Troupe. 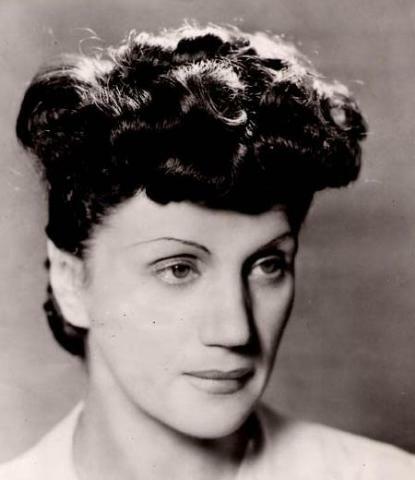 Luba eventually married fellow actor Joseph Buloff. Please click on the Joseph Buloff link to access a short biography of his career in the Yiddish theatre. cir 1930s "The Vilna Troupe and How Luba Kadison and Joseph Buloff Came to the United States"
"We were…the Vilna Troupe was like a family. And I grew up there…my father (Leib Kadison) was already in the States. The Vilna Troupe parted…not parted, but there were a couple--Alexander Asro and Sonia Alomis--who left the Vilna Troupe. There was a love story involved, and they formed a second Vilna Troupe. And they started to pull out actors from the original Vilna Troupe which was at that time in Rumania, in Bucharest...."
...and we had a vision for which we could do...a sacrifice. Money did not mean much to us. It's our work, our way of life, that's what meant...We came here without...not nearly fifty dollars to get off the boat, and that was predominating a lot in our lives..."
1948 Buloff and Kadison in Arthur Miller's "Death of a Salesman"
In 1949, Joseph and Luba obtained the rights to produce a Yiddish version of Arthur Miller's "Death of a Salesman" with the intention of taking it on tour in Buenos Aires, Argentina. During these post-war years, there was a large and enthusiastic Jewish population eager to see and hear Yiddish productions. Luba states, "You know we played "Death of a Salesman" in Yiddish, and that was in 1951 in Brooklyn, and Joe got the rights from Arthur Miller to produce it in Buenos Aires. I couldn't come with him, and then he came here, and he produced it here in... and it was called the Rolland Theatre. And Miller gave the rights, and the producer said okay, we want to do it. But before us there was a musical, and we were scared stiff. We come to Brooklyn with "Death of a Salesman," a serious play, and a sad play, and...we had an audience, "How did it go?" But we took the risk..."